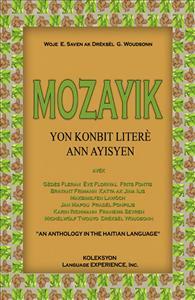 MOZAYIK: Yon Konbit Literè ann Ayisyen assembles twelve essays in Haitian Kreyòl by Haitians and Americans about topics in the humanities, social sciences, and sciences. The contributors – scholars, teachers, and researchers who are well informed about Haiti, its people and their traditions – reflect on various aspects of Haitian realities. The contributors engage their topics in ways that will stimulate critical thinking among students, encouraging them to adopt the habit of carefully analyzing people, events, processes, and forms of discourse about them. However, people of all ages and walks of life who are interested in reading Haitian Kreyol to learn about Haiti’s past, reflect on its present, and envision its future will find in MOZAYIK an array of informative and thought-provoking arguments.